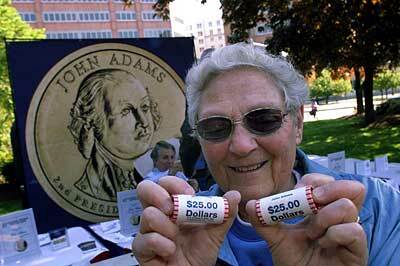 The release of the John Adams dollar coin was celebrated today in Quincy. 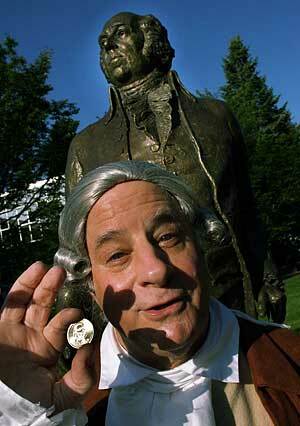 Adams impersonator Sam Goodyear holds up the new coin, near the John Adams statue. Shoppers, business owners and MBTA commuters got their first up-close look at the new John Adams dollar coin today. One Adams fan, Carlos Caso, 21, of Randolph, had been waiting since 5 a.m.
“It’s the first coin he’s ever been on. He’s never gotten recognition like this. I wanted to be the first to get one. Colonial Federal Savings Bank had sold more than 4,000 coins in the first 90 minutes. Joe Rainville, an accountant from Quincy who collects coins, bought 225 coins. Barbara Gilliland, 82, a retired nurses aide, of North Quincy bought 50 coins to send to friends in other Quincy namesakes across the country, in Illinois, Missouri, Kentucky, Pennsylvania and California. She said she started visiting the cities after Quincy, Mass., sent flood assistance to Quincy, Ill., in 1993. Gilliland said she had been eagerly awaiting the Adams coin since the presidential series was announced. Debbie Meredith, a former Quincy resident now living in Brockton, said she wouldn’t have missed today’s event at McIntyre Mall near city hall. She was impressed with the new dollar. “They’re pretty. I just can’t see spending something like this. I just want to save it,” she said. Another former Quincy resident, Barbara Beizger of Braintree, was also excited to see the new coin. Stephen McCormack, 49, of Quincy, thinks the coin will be good for the city. He predicted that it will escape the fate of previous dollar coins. Barbara Gilliland, 81, of North Quincy, holds up two rolls of John Adams dollar coins near Quincy City Hall this morning. She has visited Quincy namesake cities across the U.S., and will send some of the new $1 coins to friends there. “It’s easy to handle and not as big,” McCormack said. Five days after the U.S. Mint officially released the new coin - the first ever to bear the second president’s image - Mint director Edmund C. Moy and descendant Peter Boylston Adams joined city officials to give the coin a full, ceremonial launch in Adams’ hometown, with exchanges for paper dollars and other activities. The bright, brass Adams coin is the second in the Mint’s new “presidential dollar” series, which began in February with the release of a George Washington dollar.